bending of the rays from their geometrical path, we have the interference of the light from the two slits, producing interference bands whose distance apart is greater the closer the two slits are together. If instead of two slits we have a very large number, such as would be produced by a number of very fine parallel wires, we have, in addition to the central, sharp image, two lateral, colored images, which, when carefully examined, show in their proper order all the colors of the spectrum. This arrangement is known as a diffraction grating, and, though mentioned here simply as an instance of diffraction or bending of the rays from their geometrical path, will be shown in a subsequent lecture to have a very important application in spectrum analysis. 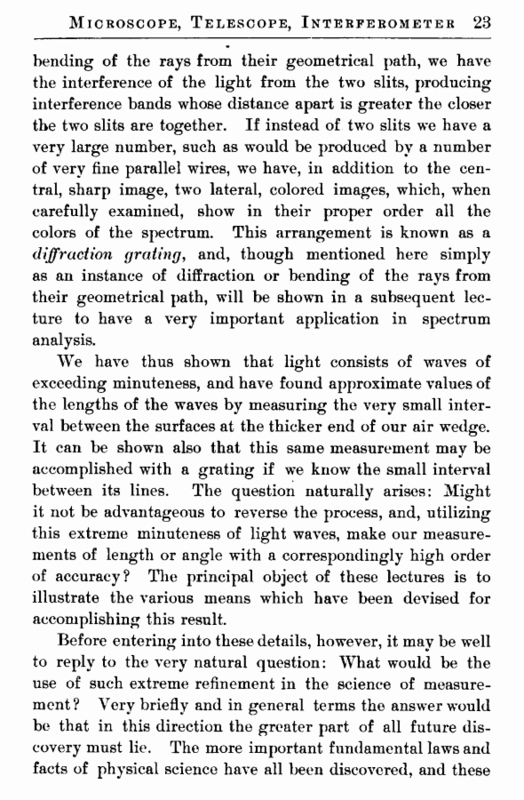 We have thus shown that light consists of waves of exceeding minuteness, and have found approximate values of the lengths of the waves by measuring the very small interval between the surfaces at the thicker end of our air wedge. It can be shown also that this same measurement may be accomplished with a grating if we know the small interval between its lines. The question naturally arises: Might it not be advantageous to reverse the process, and, utilizing this extreme minuteness of light waves, make our measurements of length or angle with a correspondingly high order of accuracy? The principal object of these lectures is to illustrate the various means which have been devised for accomplishing this result. are now so firmly established that the possibility of their ever being supplanted in consequence of new discoveries is exceedingly remote. 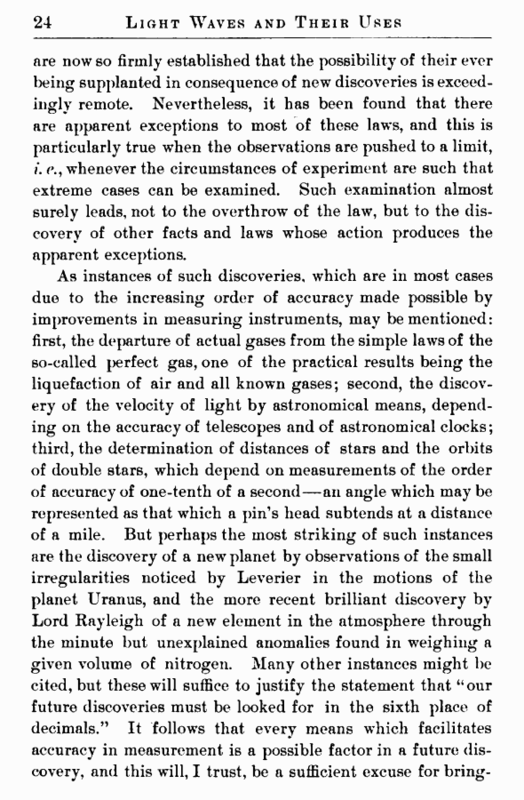 Nevertheless, it has been found that there are apparent exceptions to most of these laws, and this is particularly true when the observations are pushed to a limit, i. whenever the circumstances of experiment are such that extreme cases can be examined. Such examination almost surely leads, not to the overthrow of the law, but to the discovery of other facts and laws whose action produces the apparent exceptions.